Ultimate Kitchen Design Challenge: Vote for a Chance to Win! The Challenge: We asked two designers to create a dream kitchen featuring a brand new Silestone Eternal color option, appliances from Tasco Appliances and a faucet from Riobel. 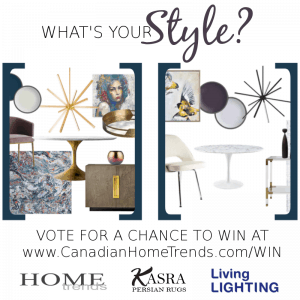 Vote for your favorite today for a chance to win a Bistro faucet from Riobel! For a look that is both modern and timeless, I started with luxurious materials like custom Jane Lockhart cabinetry in Silver Mink, Silestone Eternal countertops in Calacatta, a marble chevron backsplash and a stunning pendant light. Contemporary, quality appliances add style and function. Finally, add classic detail with black hardware, choose a faucet with a pull-down spray option and finish with beautiful bar stools. 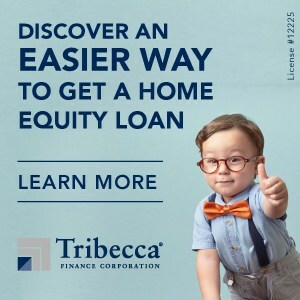 – Click here for more information and sources. I chose a mixture of industrial elements and luxurious touches for this kitchen. I selected an Indian Brown brick veneer for the back wall. Yorkshire cabinetry in Evening Grey and Silestone Eternal Desert Silver countertops, carry a warm undertone while champagne bronze hardware and Sampson pendant lights add a touch of luxury. A professional 48″ Heritage range makes this kitchen a chef’s dream and industrial touches like the Bistro faucet and Yaletown stools finish the look. – Click here for more information and sources. Use the widget below to vote for your favorite design board and then earn extra entries using the listed options! 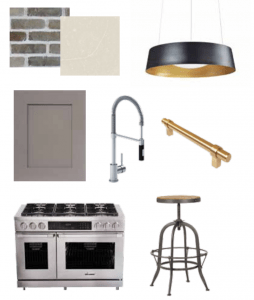 One lucky contestant will win a Riobel Bistro Faucet as seen in Marc’s design board! 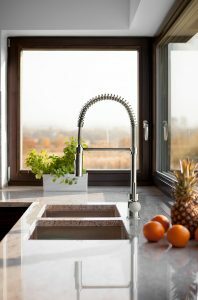 This stunning kitchen faucet offers the perfect combination of modern style with improved functionality and classic lines that suit any kitchen style! I choose Marc Atiyolil’s Industrial Luxe Kitchen Concept as my favourite. I like Marc Atiyolil’s Industrial Luxe concept. It’s a look I can see myself loving for a long time. I like Jane’s design board because of the timeless concept and the comfier bar stool. I like Jane Lockhart’s Modern & Timeless Kitchen Concept as it is sleek and modern! Jane Lockhart’s Modern & Timeless Kitchen Concept has my vote. it feels warmer and love that light fixture! I like Jane Lockhart’s Modern & Timeless Kitchen Concept because I like the lighter tones used. I think I choose Jane Lockhart’s but I’d like to combine elements from both. my vote goes to Jane Lockhart’s design. I like that the colors are lighter but with dark accents . I like Marc Atiyilil’s design. I am tired of the pure modern look by Jane Lockhart. Everyone seems to have it. Marc’s look is more original and interesting. I choose Jane Lockhart’s design.I love the different textures and the light and airy look. I love the BI201 BISTRO TALL KITCHEN FAUCET WITH SPRAY, gorgeous. I like Jane’s board as I like the black hardware & the chevron backsplash! Very cool! I like Marc Atiyolil’s because of that oven, one of these days I would love to have something like that!! I like Marc Atiyilil’s design. Industrial Luxe is so glamorous, like out of Fixer Upper! I choose Marc Atiyolil’s Industrial Luxe Kitchen Concept. I like Marc’s design. I am partial to the Industrial look. Marc Atiyolil’s Industrial Luxe Kitchen Concept,I like the stove :). I like Janes best because I think I would never grow tired of those choices. I like Marc Atiyolil’s Industrial Luxe best because the colours appeal to me more. I like Marc style but prefer white cabinets. I like Jane Lockhart’s Modern & Timeless Kitchen Concept because it has white cabinets which are my favorite for timeless design. I like Jane Lockhart’s modern and timeless kitchen. I like Jane’s more because it is clean and modern yet has a touch of feminine to it. I like Jane Lockhart’s Modern & Timeless Kitchen Concept as it is perfection! I like Jane Lockhart’s design board…very sleek. I like Jane Lockhart’s design board because her items shown are very beautiful, especially the fridge. I like Marc Atiyolil’s because it’s more my style and look at that oven! I would choose Jane’s. Love the more neutral colours. I like Jane’s. It’s modern, clean and timeless. I choose Jane Lockhart’s Modern & Timeless Kitchen Concept. I like more modern look of the appliances. I choose Jane Lockhart’s concept. I like the refrigerator. I love Marc Atiyolil’s design the best. because I love the earthy tones, black details, and brick! I prefer Jane’s as the colour selection is brighter and fresh. Marc’s that range is to die for! Marc’s board is my favourite. I like his style. I prefer Jane Lockhart’s Modern & Timeless Kitchen Concept. It’s cooler and more colourful. I prefer the Jane Lockhart design board. I like the lighter colours and the silver accent over the gold in the other board. I love..Marc Atiyolil’s Industrial Luxe Kitchen Concept board the best because the kitchen is the hub our our home, lots of cooking and baking..love the stove! I love Marc’s design because of the brick look! Jane’s design would be my pick. It would fit it nicely with my present decor. I prefer Jane’s because it seems lighter and brighter and more feminine than Marc’s. I prefer Jane’s board because it would look nice with what I already have in my house. I love the Jane Lockhart’s Modern & Timeless Kitchen Concept because it has a new but classic look! Love it! I prefer the Jane Lockhart’s Modern & Timeless Kitchen Concept, Love the light fixture and its more modern to me. I like Jane’s because it suits my kitchen better. I prefer Jane’s because i like the lite cabinets and marble backsplash. Both are absolutely gorgeous, but I really like Jane’s light fixture and tile options(and the faucet, of course). I like Marc Atiyolil’s Industrial Luxe Kitchen Concept. I have those stools. I prefer Jane’s as i like the chair and light fixture. I like Marc’s style, largely because of the cabinets and backsplash. Not a big fan of marble in a kitchen. I like Jane’s design withnthe lighter tones. Jane Lockhart is the one I like. I prefer the warmer design of Jane Lockhart’s. I love elements of both, but overall, I prefer Marc`s design. I really love the industrial luxe looking concept, though I am not a huge fan of the stool. I love the brick detail and I could do without the brass/gold hardware. This was a tough decision – ultimately I would try to incorporate elements of both designs. Marc Atiyolil’s Industrial Luxe Kitchen Concept is my favourite! It is stylish and fun and I love it! I love Jane’s board because I love lighter colours. I love Marc’s kitchen the best! I really love Jane Lockhart’s Modern & Timeless Kitchen Concept! Jane Lockhart’s Modern & Timeless Kitchen Concept is my favorite because I prefer the modern look. I like Marc’s because of the cabinet colour. I chose Jane’s design. I like the modernity she employs in her choices. I like Marc’s better with the brick and the industrial metal look. Marc Atiyolil’s Industrial Luxe Kitchen Concept. I prefer Jane Lockhart’s concept because of the soft neutral colours and the awesome light fixture. I prefer Jane’s board because the design looks more neutral. They are both lovely, I love the gold accents in Marc’s, but have to go with Jane Lockhart’s, because I prefer the chevron pattern there! I prefer Jane Lockhart’s design. I prefer Jane Lockhart’s design, as it appears brighter and more likely to integrate into my home’s decor. I like Marc Atiyolil’s Industrial Luxe Kitchen Concept best because I love that stove. I prefer Marc’s overall but those stools are horrible. Both are nice but prefer Jane’s more! I like Jane’s board, especially that light that she chose. I like Mark’s best, mostly because i prefer the lighting. I like Jane Lockhart’s best because of its modern look and features. I like Jane’s! I think it looks more modern. I like Jane Lockhart’s Modern and Timeless Kitchen Concept board… I like the sleek and classic design. Jane Lockhart’s Modern & Timeless Kitchen Concept is my favourite, because of the marble chevron backsplash. I’m bored with rectangular subway tiles. I prefer Marc Atiyolil’s Industrial Luxe Kitchen Concept personally 🙂 It looks warmer than the other one! Jane Lockhart…a touch of bling. I like Jane’s board as I like the simplistic style of it. I like jane lockharts desgn more ..seems more comfortable and down the earth . I choose Jane’s elegant style of designing. I prefer Jane’s. the design has ‘softer edges’ …if that makes any sense. More visually appealing to me. I prefer ‘Marc Atiyolil’s Industrial Luxe Kitchen Concept’ best; it’s more homey and comfy. I prefer Jane’s for its classic look. I like Marc’s design best. I like Jane’s design best as it contains more light coloured elements. I like a white kitchen. I choose Jane’s design love the lighter palette. I like Marc’s. The aesthetics appeal to me more. I like the uniqueness of the accents. I like Jane’s, its more to my taste! I prefer the look of Marc’s Industrial luxe kitchen concept. I particularly like the professional 48″ Heritage range. I love elements of both, but in this case I’ve gone with Jane’s design as I feel that while beautiful, it is also more practical. I like Marc Atiyolil’s design because it seems more neutral. My husband doesn’t like anything that looks too feminine and I think Marc has the balance that would please everyone in the household. I like the modern look of Janes design. It really resonates with me. Marc Atiyolil’s choices are amazing! I like Jane Lockhart’s Modern & Timeless Kitchen Concept, I like the cabinetry in Silver Mink, Silestone Eternal countertops in Calacatta, a marble chevron backsplash, clean and bright contemporary look. I like Jane’s design because it suits more to my style. I choose Jane Lockhart because of the backsplash & the light. Jane’s because it matches my taste. I like the design of Jane Lockhart because of the modern design. I like Jane’s board the best because of the modern look. I go with Marc Atiyolil’s Industrial Luxe Kitchen Concept though wheres the fridge 🙂 I could make it my own I love exposed brick & a big honking gas range. I like Marc’s the best! Exactly what I want for my kitchen! I like them both but prefer Jane’s as it more my style. I like Jane’s the best…although they are both nice.. I like Jane Lockhart’s design. It appeals to my tastes more. The Riobel Momenti line is awesome! I can’t even imagine the convenience of being able to set the shower ten and leave it! I like the flexibility of being able to rough in the tub filler now and decide on the model and finish later. I like Janes Modern &timeless kitchen concept. I really like Marc Atiyolil’s Industrial Luxe Kitchen Concept look. The light fixture and the brick veneer have strong, clean lines. I’m a bit of a minimalist. I love the clean look of Jane Lockhart’s design! I choose Jane Lockhart – love all the choices she picked. I like Marc Atiyolil’s Industrial Luxe Kitchen Concept. I like Jane’s design board a lot. I like Marc Atiyolil’s Industrial Luxe Kitchen Concept the best because I think it’s gorgeous and what I would want for my house. It would make me feel at home right away. I prefer Marc’s design, because it has a colour in it. I prefer Jane’s because it’s more modern looking and I love the light fixture. I prefer Jane Lockhart’s Modern & Timeless Kitchen Concept because I would love to own each individual piece on it’s own merits and I love how they come together in the overall concept! I like “Marc’s board for the touches of rustic he uses. Hard choice, but I prefer Marc’s design. My choice is Jane Lockhart’s Modern & Timeless Kitchen Concept. I especially like the two door oven and the neutral colours. A thumbs up for Jane! I like Marc Atiyolil’s Industrial Luxe Kitchen Concept because it has that industrial look that brings a personality to the room. I like the woman’s style. Jane all the way! 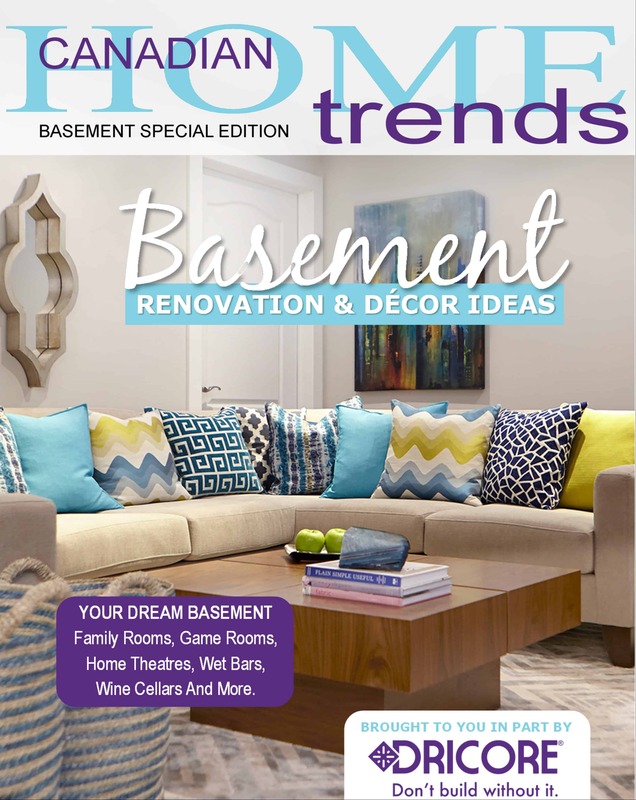 I love Marc’s design….the brickwork, neutral colors and that Heritage range is awesome! I like Jane’s design better overall, particularly the lighting but I will admit I am definitely attracted to Marc’s choice of oven even thought I think it would be too large (and therefore impractical) for my place. I will chose Jane’s, I like the neutral colours, it was toss up! I chose Marc Atiyolil’s Industrial Luxe Kitchen Concept. But Jane Lockhart’s was brilliant too!! I like Marc Atiyolil’s Industrial Luxe Kitchen Concept a bit more as it is a bit simpler, a bit more classic, in design. I prefer Marc Atiyolil’s Industrial Luxe Kitchen Concept. Marc Atiyolil’s Industrial Luxe Kitchen Concept. I love the stove and the brick look. I would go with Marc Atiyolil’s kitchen style. Jane Lockhart’s Modern & Timeless Kitchen Concept appeals the most to me as I prefer a classic look. i love them all but i will say Jane. perfect for my kitchen new look. I like Marc Atiyolil’s Industrial Luxe Kitchen Concept because I love the brick and I find the style very appealing. I’m leaning toward Jane’s because it’s fresh and light. love them both but first would pick the Industrial Luxe Kitchen concept, just a bit more stylish for me thanks! I loveJane’s. It suits my house! I love the big stove in Marc Atiyolil’s Industrial Luxe Kitchen design. I prefer Jane’s timeless design. I like Jane Lockhart’s design best because of the appliances. Definitely liking the industrial kitchen concept! I like Jane Lockhart’s but this was a close call. I liked the backed black, chairs, double stacked oven, the light fixture. I wasn’t wild about the gold accent in Mark’s styling. I like Jane Lockhart’s. The design looks light and airy. I like Jane’s design better because it feels light and airy – which is important if your kitchen isn’t that big. I prefer Jane’s design. I love the cabinetry colour! I vote for Marc`s design. I like Jane’s choices – more feminin. I prefer Marc Atiyolil’s Industrial Luxe Kitchen Concept because it fits my style better. I like Jane Lockhart’s Modern & Timeless Kitchen Concept the best! I love Jane Lockhart’s design best (although, it’s close!) – I love her mix of modern and clean designs, and the colour scheme. I like Jane’s as it seems to be more my style. I like Jane’s more modern style. I like Marc’s! The colour palette is more to my tastes. I like Marc Atiyoli’s industrial kichen because of the 6 burner gas stove. I prefer Marc’s design board. I found it to have more character and warmth. Jane Lockhart’s board is my choice. Pretty much my dream kitchen. I would like to vote for Ms Lockhart’s Design…quite creative and innovative. I like Jane’s the best! I love Marc Atiyolil’s Industrial Luxe Kitchen Concept – it’s so sleek and kind of matches our decor! Love that style. I prefer Marc’s because of the bricks and generally older style. I love Jane Lockhart’s Modern & Timeless Kitchen Concept because of the double wall oven! I like the clean sleek look of Janes. I love Janes kitchen. She has comfort & elegance built in? I like Jane’s board. I love the chandelier, stools and tile! I would choose Marc’s because I find the fixtures more appealing. My favourite is Jane Lockhart’s design. I love her light fixture. I like Marc Atiyolil’s Industrial Luxe Kitchen Concept because of the stove he selected. It’s the stove of my dreams! I like Marc’s. Would love to have that stove! I like Jane Lockhart design. It appears so calming. I prefer Marc’s kitchen as it more to my style – sleek and clean. Jane Lockhart’s Modern & Timeless Kitchen Concept – Love that herring bone tile! I LIke Jane Lockharts Design It Isn’t Too Cold & Sterile ! I choose Jane Lockhart – so classy and love a little bling! I prefer Jane’s as Marc’s stool looks like a torture device. I love Jane’s design. Our home and tastes lean towards the classic and this to me suits our style perfectly. I vote for the Marc Atiyilil’s design! Industrial Luxe is timeless! I chose Marc Atiyolil’s Industrial Luxe Kitchen Concept because it is more robust. Marc Atiyolil’s Industrial Luxe Kitchen Concept because I love the way they all fit seemlessly together. I like Jane Lockhart’s concept the best because it is modern and the colours and textures would work with a variety of accents. I like Jane. Very modern. I chose Marc’s Industrial Lux kitchen concept mainly because I really loved the chef choice of stove,do not like black appliances and preferred the bronze light fixture.It was a difficult choice as there were some things I preferred from the other choice,however in the end I chose practicality where cooking is the prority. I think the stove would be a dream,like the designer noted in his description. I really liked the versatility of customizing your showers and faucets. The digital component for setting the optimum temperature for you was a very practical component to this shower. It is nice to be able to choose the faucet after you have roughed in your shower. I like Marc Atiyolil’s Industrial Luxe Kitchen Concept as my favourite design. I like both but prefer Jane’s design. I can’t stand gold… so, sorry Marc, my vote goes to Jane! I like Marc’s design the best! I love Jane’s because it seems to go best in my own home. I love Marc’s design board! The combination of elements creates warmth. I prefer the Jane one for the most modern design and eclectic collection of unique items. I’ll go with Marc . I vote for Jane. I love the way white, black, grey, silver/stainless steel look together in a kitchen. Her choices are perfect and create an elegant look. I love items in both collections! I like Jane’s she has great taste. Marc Atiyolil’s Industrial Luxe Kitchen Concept! While you designate Marc Atiyolil’s design as Industrial, I find it warm and traditional as compared to the other design. I like the cupboard style better and the brick backsplash. Seems homey and says comfort and that is me. While you designate Marc Atiyolil’s design as Industrial, I find it warm and traditional as compared to the other design. I prefer his choice of cupboard and backsplash. Seems homey and says comfort and that is me. Love the settings for the temp control! I really love Marc Atiyolil”s design. Brick & natural colours are a preference of mine. 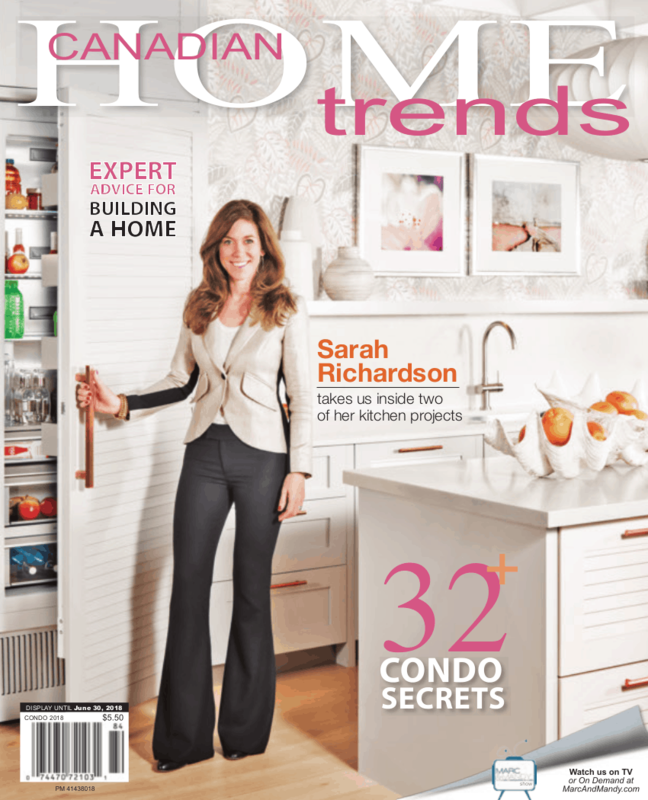 Jane Lockhart’s Modern & Timeless Kitchen Concept is my pick – I love the warmer feel it has then the other option. And I LOVE the ceiling light. Marc Atiyolil’s design is my favourite. Jane gets my vote love it! I like Marc Atiyolil’s design. The brick back splash, design of the stool and the aesthetics of the stove/oven appeal to my sense of style more so than Jane Lockhart’s design. I vote for Marc Atiyolil’s Industrial Luxe Kitchen Concept! I especially love the grey cabinets, the cool pendants and the edgy bronze hardware. My favourite is Marc Atiyolil because I love the stovetop. I prefer Marc’s design board. I like Marc Attyoli’s kitchen design .. it has many things that I would choose for my own kitchen! I prefer Marc Atiyolil’s Industrial Luxe Kitchen Concept. This is truly my kind of kitchen. I think I would choose Janes. It’s a tough choice but I think I’d have to go with Marc Atiyolil’s Industrial Luxe Kitchen Concept. I love the brick and earthy feel of the cabinets. Of course the fact that I’m from Yorkshire, might have something to do with the reason I was drawn to them! Not to mention the heritage range would make cooking even more enjoyable than it is today. Great look! I gave vote to Marc Atiyolil’s Industrial Luxe Kitchen Concept! Marc’s Industrial Luxe Kitchen Concept – I like the gold and black. Jane Lockhart’s is more my style. I vote for Marc Atiyolil’s Industrial Luxe Kitchen Concept, because I like the industrial lookand huge range. I prefer Mark Atiyolil’s design because I like the scale & weight of the industrial elements -Heritage range, metal/wood stools, brick walls etc. The Bistro faucet is my favorite (having spent many years working in restaurants) and it absolutely fits with the industrial style of this kitchen. Inspired by the Momenti Collection. So many finishes and handle options. Would be perfect for my cottage bath! The Riobel Genius Shower system is amazing. I could really use the digital temperature control feature! It’s great that the Riobel Tub Fillers can be roughed in ahead of time and then you can wait to select which model you want later. So many decisions! I like both, but prefer Marc’s a little more. Jane’s – the colours of the cabinet and the tiles / countertops are more more style. Jane Lockhart’s Modern & Timeless Kitchen Concept. I like the clean look and that the look takes from classic style but is somehow looks updated. I prefer the clean bright look of Jane Lockhart’s Modern & Timeless Kitchen Concept over the industrial look. But I would look for a different light fixture. Marc Atiyolil’s Industrial Luxe Kitchen Concept. A professional 48″ Heritage range makes this kitchen. I liked Marc’s best as it was just a little warmer which is more my style. I like Jane Lockhart Modern and Timeless Kitchen colors and the selection of products give it the modern and timeless look! I choose Jane Lockhart’s Modern & Timeless Kitchen Concept because I LOVE everything about it! It’s sleek, classic, timeless, and modern pieces are combined perfection!!! 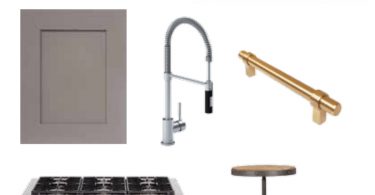 I also love the Riobel Bistro Faucet, as seen in Marc’s design board! I like the Mark’s the best. I choose Jane Lockhart’s Modern & Timeless Kitchen Concept as my favorite. Marc Atiyolil’s Industrial Luxe Kitchen mainly for the professional 48″ Heritage range. BORA TALL KITCHEN FAUCET WITH SPRAY because it has a magnet! Jane Lockhart’s is beautiful and timeless. You would not feel it was outdated after only a few years. I like Marc’s and the warmer tones. Like the showers that move up and down for different sizes. Love the computerized selection of showers heads and temperature. I like the touch of black. I would choose Jane Lockhart’s because I like the strong and simplistic looks. Marc Atiyolil’s room because it has elements that would appeal to both my wife and my tastes. I choose Jane Lockhart’s design. I like the timeless and modern kitchen! Jane Lockhart’s Modern & Timeless Kitchen Concept. Seems like Stove would be too wide! 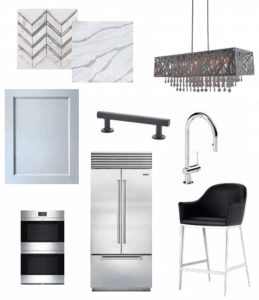 Jane Lockhart’s Modern and Timeless Kitchen Concept design board – like the modern look with the backsplash and counter tops, silver mink cabinetry with the black hardware and the stunning pendant light. Beautiful! I like Marc Atiyolil’s Kitchen concept. I like Jane Lockhart’s design. Hard to choose but i really love Jane Lockhart’s Modern & Timeless Kitchen Concept. really everything its so modern and beautiful. I like Jane’s. I love the light and the textures of this design! 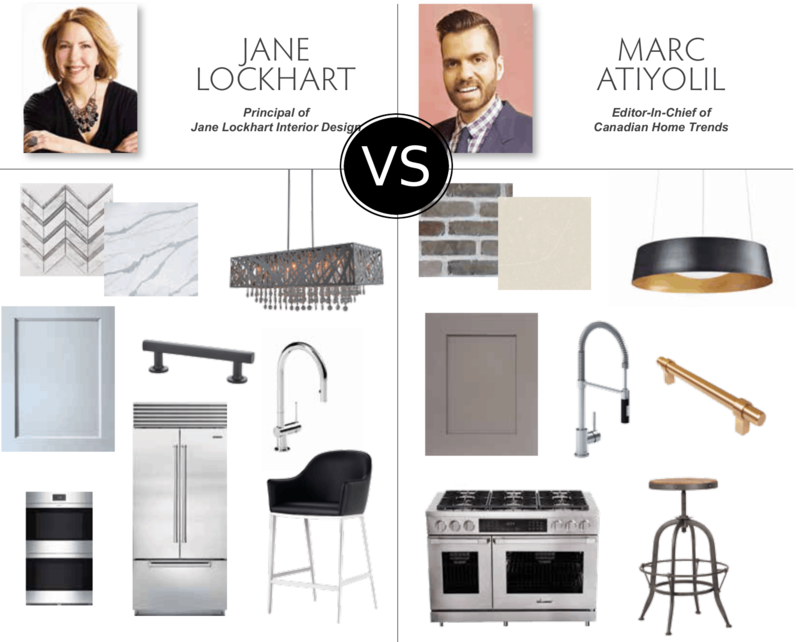 I vote for Jane Lockhart’s Modern & Timeless Kitchen Concept because the colours chosen flow better together than Marc Atiyolil’s. I like Jane Lockhart’s design! It’s elegant and timeless, and totally my style! I like Marc’s design this time around. Jane Lockhart’s design is my choice. I like Janes design best! I love Jan’es mainly because of the chevron backsplash and light fixture. I chose Marc Atiyolil’s design board as I really like the industrial look yet it’s still warm and inviting. I’m renovating my kitchen in the Fall and this is exactly the kind of look I’m aiming for! I like Jane’s design because I love silver and geometric accents! I chose Marc Atiyolil’s Industrial Luxe Kitchen Design Board,because I like the touch of luxury added in with the warm undertone vibe to it.